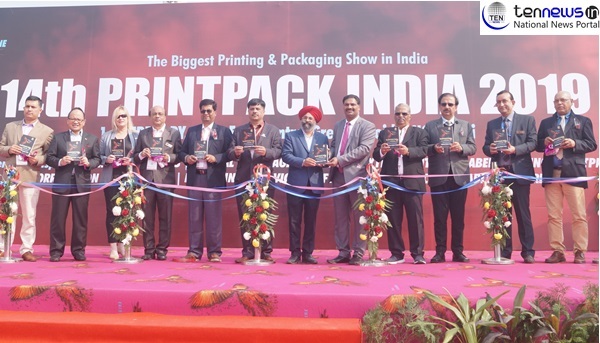 Today Printpack India 2019 has inaugurated its 14th Exhibition at India Expo Mart Greater Noida. The event began with cutting the ribbon where all the senior officials of the Company and Rakesh Kumar Chairman of India Expo Mart remained present. Arrangements are being made with sister associations like Association of Label Printers & Suppliers, Indian Paper Corrugated & Packaging Machinery Mfg. Association, Federation of Corrugated Box Manufacturers, All India Federation of Masters’ Printers and other Allied associations to mobilize visitors. IPAMA has also inked MoUs with overseas associations in China, Egypt, Nigeria, Italy, Sri Lanka, Bangladesh, Nepal, and other neighboring countries for mobilizing visitors from overseas. In the last five months, IPAMA had participated in more than 75 Indian and foreign exhibitions & conferences for the promotion of the event. As a result, a massive footfall of visitors is expected in Printpack India 2019.